When couples decide to end their marriage, not only must they sort through the emotional entanglements that come with divorce, but financial ones as well. Typically, spouses live separate and apart in the days and months leading up to divorce, no longer commingling their lives or finances. However, this act of separation is not always enough to extinguish a spouse's liability for debts, including those made during the separation period leading up to divorce. Spouses may be jointly responsible for debts and liabilities incurred during the marriage, commonly referred to as marital debt. Once the marriage ends, however, so does this joint liability: after the divorce, each ex-spouse incurs his or her own debts. The question then arises -- at what point during the separation or divorce process do the spouses stop incurring marital debt and begin to incur their debts separately? The answer depends in part on where you live. The criteria for determining when you are no longer responsible for new debt your spouse incurs varies. In some states, such as California, the law simply states spouses cease being responsible for the debts of the other as of the date of separation. Although a formula for determining this date is not provided by statute, relevant case law has revealed that courts consider a couple effectively separated the moment they begin holding themselves out to the public as separated, live their lives separate and apart, and don't engage in behavior that suggests the marriage has not ended, for example, by engaging in sexual relations or attending marriage counseling. In other states, such as New Jersey, your liability for your spouse's new debts stops as of the date the divorce complaint is filed. 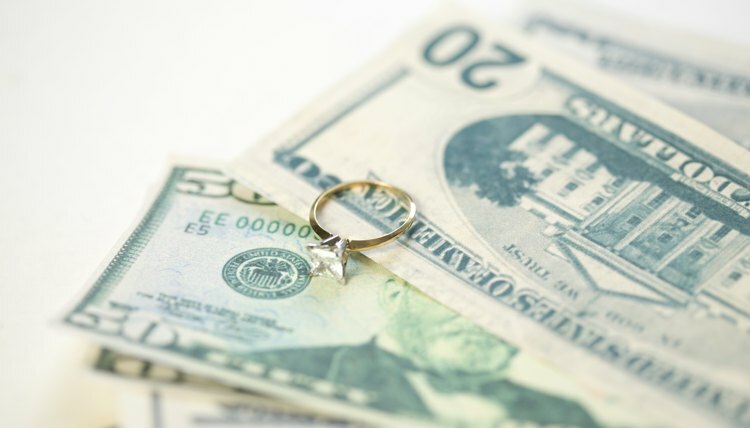 If a spouse accumulates debts during the divorce process that are for necessities -- not luxuries -- for either himself or the children of the marriage, the court may assign these debts to either spouse, usually based on which one has the ability to pay. Debts considered "necessary" typically include food, shelter, transportation and medical bills. Even though you are getting a divorce, creditors may legitimately come after you for debts they consider jointly owned, for example, for credit cards held in both your names, even if the debt was incurred after your state considers your spouse liable for his own debts. Therefore, it's best to close all joint accounts as soon as you know you're divorcing. Additionally, creditors may also pursue you for your spouse's debts while you are still married, if they are unable to collect from him directly. You may be able to stop such collection efforts by asking the court to assign this debt to your spouse in your final divorce decree. However, with respect to joint accounts, creditors don't have to abide by the decree. One option is to pay the debt and take your ex-spouse back to court for reimbursement. Indiana Legal Services: Can a Creditor Come After Me for My Spouse's Debts? Georgia is an equitable distribution state, so one spouse always runs the risk of having more than half the marital debt assigned to him for payment in a divorce. Courts in equitable distribution states are not obligated to divide marital property or debts 50/50. The law gives judges the discretion to distribute debts and assets between divorcing spouses in a way that seems fair. Judges can take several factors into consideration, including the respective incomes of the parties and their ability to pay. This can result in a 60/40 distribution of debt, or even 70/30.